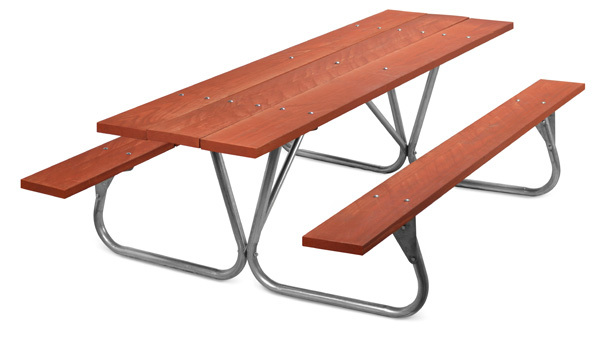 Park Ranger outdoor tables are strong outdoor tables, that are often seen at national parks, forest preserves, and picnic areas. The 1-5/8" O.D. galvanized high alloy steel tubing make up the portable frame. 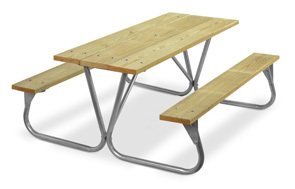 The bracings on the outdoor tables are also galvanized for maximum corrosion resistance and secured with zinc plated hardware. 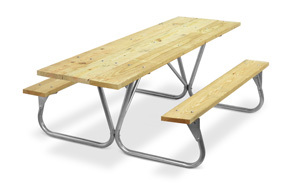 All wood seats and tops are made with DEE Grade Southern Yellow Pine, which has fewer knots, splits, and warping than the standard wood used by other companies throughout the Parks and Recreation Industry. Our wood planks are either Untreaded, Redwood Stained or MCA Treated southern yellow pine, and are available in 6' or 8' lengths. Planks are pre-drilled.